A couple of things we talked about during the last class about adjusting the pay outrageous. That's something that almost has become second nature. What do you do to get the value have stop and check every number because you're locking everything in forever and you want to make sure they're internally consistent. Incidentally I haven't finished a DCF yet. Something else got in the way I did travel yesterday so I'll try to get them by the end of the week. As I said you not dying to get back to DCF. I would think. But let's start today's class with a question about what's coming next. Today towards the end of the class we're going to do a pivot pivot away from intrinsic valuation to pricing. So here's the first part of the pivot. If you're a valuable commodity company it is it is it impossible to value a commodity company without taking a point of view. And so today for instance we're going evaluate oil company. And when people value oil companies they say it's impossible to value an oil company without taking a point of view on oil prices. Is that true. Can you value an old company without taking a point of view and oil prices. But. What does that mean when you say unbiased what does that mean. The only thing that I can tell you is the price right. So in a sense the probability is something you might decide to build around the price the market is decided that it delivers a number price today as you value your company as of today. It's first let's say lets you know that price is what it is. You can think it's high or low but it is what it is. Completely tied the company is to oil price. You can try it's almost impossible to do. Yep. One step ahead of me that's exactly what I'm going to do because when I value oil companies is it true the oil companies value of actually are priced. Absolutely. Is it also true that forecasting oil prices has become impossible to do. I think so here's what I'm going to try to have my cake and eat it too I'm going to value the company at today's oil price. And then I would look at oil prices or distribution because I'm not saying oil prices will not change in fact I'm just saying I don't know which direction and how much that distribution is a perfect way to bring it so we can have a cake and eat it too. 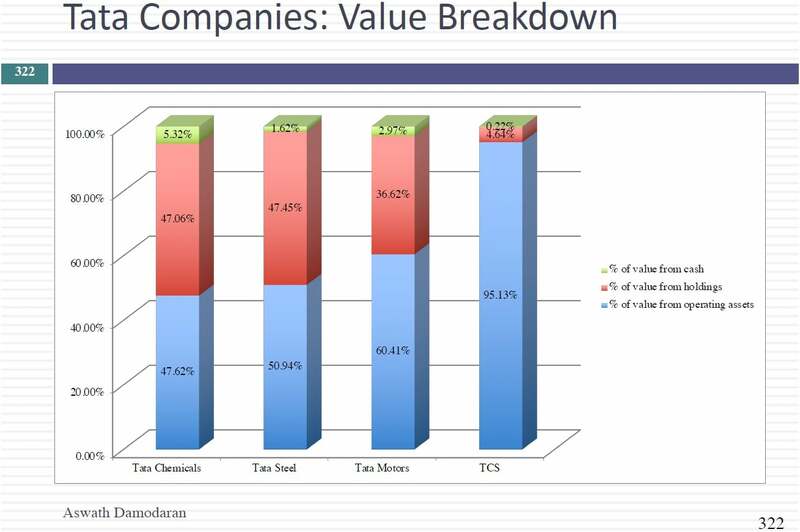 It's a great way to value commodity companies with. Because I'm going to argue about the dangers of putting a commodity price fear into a commodity company is your commodity price views then when you drive what you think about the company. You see what I mean if you think oil prices are going to double over the next five years what do you find at the end of your valuation roll that looks cheap to you. So we're going to talk about the dangers of commodity prices and how to get around so let's say you value Amazon today mean the valuation and you come up with five hundred and fifteen dollars per share. Let's hit a stock history. Let's update the numbers. Let's say you value Amazon today I think it's trading around 6500 today. Seventeen hundred. Let's say you're valued at. Fourteen hundred and strany at seventeen hundred which of the following statements most likely explains the difference The first is the market is much less optimistic about the company's fundamentals than you are is it more optimistic. What's the prices higher than your value so the market must be more optimistic or maybe the market is not even looking at fundamentals. If you are an intrinsic value person you're trying to explain away the difference with fundamentals. But. Price good. It could be that they are just pricing the stock. We take a look at what was happening since the IPO. Do you think fundamentals are driving it. I think it has nothing to do with fundamentals. That's one of the reasons we're going to focus on pricing is we want to get a sense of how the pricing game is played not because we want to play it or I want to play it but if I'm an investor I need to understand the pricing game because that's how I ultimately will make money. So one reason I'm going introduce the game is for us to understand so fine a point in this something is something we've kept talking about. You know you come up with the companies that are undervalued and you're trying you need to if you're going to act on that valuation which is the fall in faith in your estimate of value.